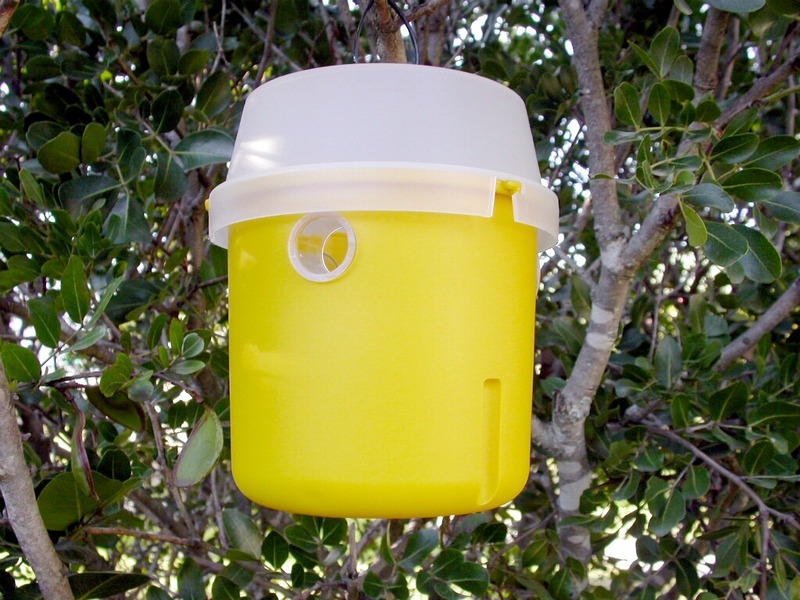 Monitoring fruit fly populations, using traps baited with lures, is one of the cornerstones of an SIT programme both before and after the release of sterile males commences. Monitoring before sterile releases is necessary to establish that the wild fly population level is sufficiently low. Monitoring after releases is necessary to evaluate the success of the SIT programme. Standardisation of traps and lures throughout the SIT area is crucial so that fruit fly population data on all farms and in all areas can be directly compared. Trap density: In orchards and vineyards, Yellow Delta traps should be placed at a density of 1 per 25-ha block. This will change after the start of sterile fly releases. In towns, the trap density should be about 1 per 5 to 10 ha, and in natural vegetation around the perimeter of the SIT area, about 1 per 50 to 75 ha. Clearly number each trap using a permanent marker for data recording purposes. Each trap number must remain permanently associated with the same 25-ha quadrant. The GPS coordinates of all traps should be recorded and entered into the SIT GPS system. Indicating the different wild fly population levels on maps or GIS systems with different size or colour of dot, e.g. 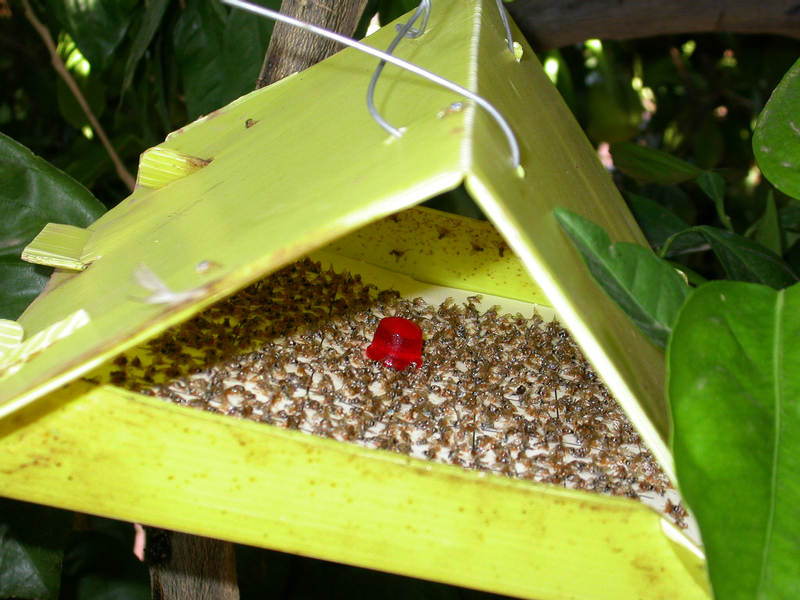 green for zero flies trapped, yellow for 1 to 10 flies/trap/week, red for more than 10 flies/trap/week, is a very useful way of keeping up to date with the changing population densities in different areas of the SIT programme. 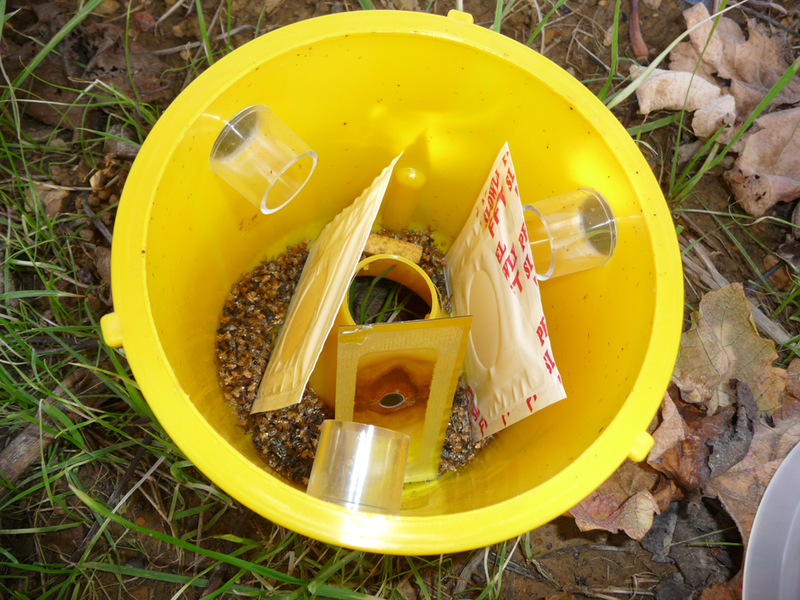 Trap placement: Install traps in late winter to establish baseline infestation levels. Where possible place traps in ornamental trees with reasonably dense foliage rather than in fruit trees, as male fruit flies prefer more dense shade. Traps should be as high as practical (± 2 m), and inside the canopy of the tree on the south eastern (cooler) side. Remove any foliage that comes into contact with the trap. Ensure that the trap entrances remain unobstructed throughout the year. Lures: Place the lure on the glue in the centre of the trap bottom, and ensure that it is not covered with gum. Trap maintenance: Maintain traps and replace lures strictly according to the manufacturer’s specifications. Lures and trap bottoms must always be effective, or incorrect decisions will be made. Trap bottoms should be replaced sooner than specified if it is evident that the glue is starting to get depleted, or when it is obvious that its efficacy in trapping fruit flies is decreasing, for example when there is excessive dust or debris in the glue. Replace the whole trap if it becomes misshapen or damaged. Trap rotation: If any trap records zero catches for more than a couple of weeks while other traps nearby are trapping fruit flies, move this trap 100 to 200 m away in the same 25-ha block every 4 to 6 weeks. Record any new trap positions on the GIS system and on the aerial photos in the operations centre. Trap rotation may be necessary avoid a trap staying in one locality in a 25-ha block with an unusually low fruit fly population, which could give a false impression of the block’s population density. Choice, density, placement and maintenance of traps: The detection of wild female fruit flies during this phase of the programme is crucial, as the presence of fertile females is the real danger in an SIT programme. If male-only traps are used, they will catch high numbers of expensive sterile males that should rather be free to mate with fertile females. Trap type: Replace all Yellow Delta fruit fly traps with Chempac bucket-type traps baited with the 3-component lure that also catch females. These traps are so-called “dry traps”; flies are not caught on a sticky pad as with male-only traps, but are retained in the semi-closed trap by a fumigant which kills them. Trap density: In orchards and vineyards, place traps at a density of 1 trap per 49-ha block and record the geographical coordinates using GPS. Positions of traps can again be indicated on the operations room maps, and should also be marked on the digitized GIS maps. In towns, trap density should be about 1 trap per 5 to 10 ha, and in natural vegetation around the perimeter of the SIT area, about 1 trap per 50 to 75 ha. Summer season (October/November to about June): Traps are moved from gardens to orchards because most sterile males are released in farm and urban gardens, and one does not want to trap sterile males. Winter season (about June to October/November): Traps are moved back to gardens, because sterile males are released in urban areas only. Progress with the SIT programme is monitored using bucket traps baited with the 3-component lure, which traps both males and females. All flies trapped are inspected under a fluorescent light for sterile flies (showing fluorescent dye that was applied during the pupal stage) and wild flies (no dye). The fewer wild flies that are caught, the more successful the programme. Ideally, one would like to trap zero wild flies over a period of at least 12 months (= eradication). An area where an average of e.g. 0.001 wild flies per trap per day or less are caught for 12 or more months could qualify as an area of low fruit fly prevalence.